A Traveller's Diary (A Private Collection) is the first solo exhibition in London of works by the celebrated Malaysian watercolour artist Chang Fee Ming (b.1959). 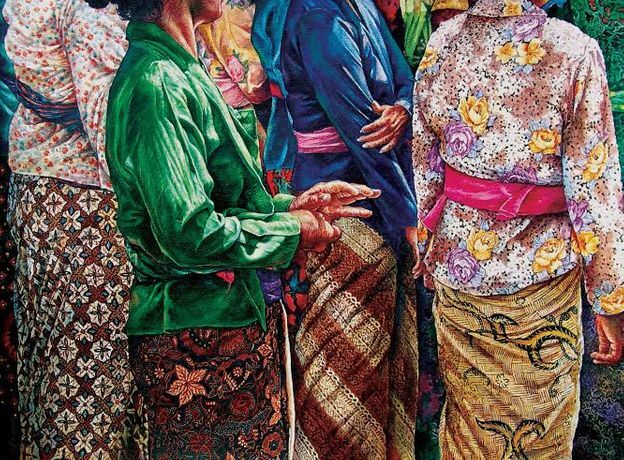 Around forty works from the private collection of Daniel Komala, founder of Larasati Auctioneers and art gallery One East Asia, Singapore, are being shown in this non-selling exhibition. Alongside the collection there are three specially commissioned large watercolours and more than 10 smaller paintings and drawings, all of which are available to purchase. Fee Ming's subject matter is the lives and culture of the ordinary working people of rural Southeast Asia: members of remote communities whose traditional ways of life are threatened with extinction; the fishermen and their families in the coastal villages of peninsular Malaysia; or the inhabitants of Bali enjoying the ceremonies that have formed the framework of life on the island for generations. Daniel Komala started the collection in 1993, when first saw Chang Fee Ming's work hanging in the Bamboo Gallery, Bali. Over the twenty intervening years it has grown to include the large, almost luminously coloured and intricate figurative works for which Fee Ming is most widely known, as well as watercolour sketches, and pen and ink drawings on envelopes that Fee Ming has posted to Daniel during their two decades of friendship. A book to accompany the exhibition, A Traveller's Diary (2014) has been published by One East Asia, Singapore, and will be available to order at the exhibition.